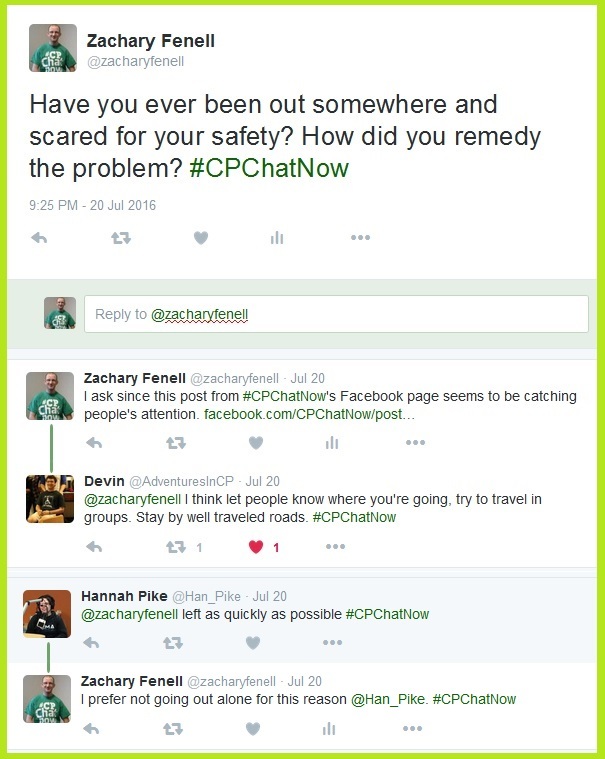 Friendship, safety, and more arose as discussion topics during Wednesday, July 20th, 2016’s #CPChatNow. Co-host Zachary Fenell here with the much delayed recap. My co-host Blake Henry will stop by later in the week with the July 27th recap. In the meantime shall we focus on July 20th? 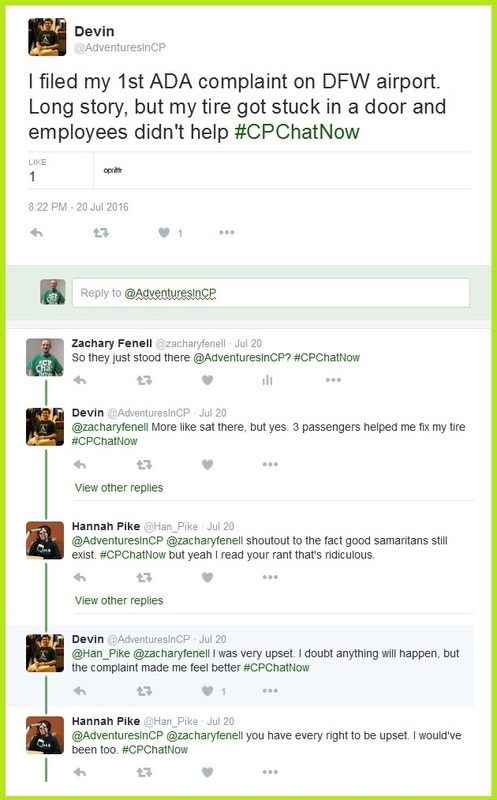 A bad experience for regular community member Devin sparked conversation early. Personal experiences kept the dialogue flowing. We discussed the tricky transition from high school to college and said impact on physical therapy. An issue regular Alena will soon face. 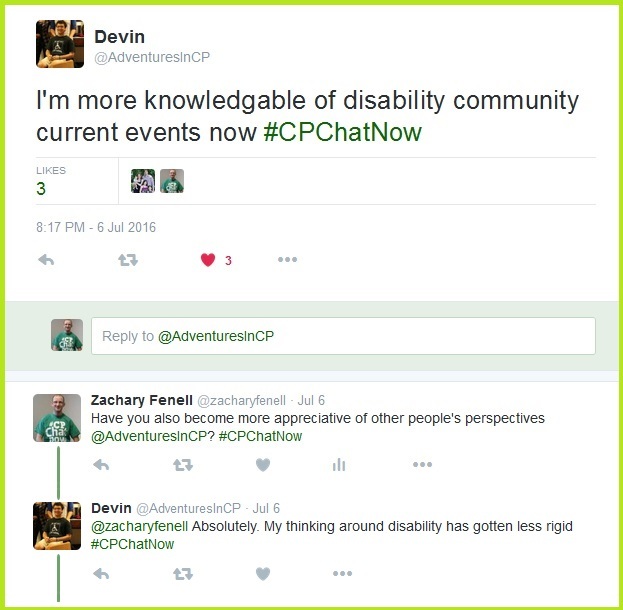 Also on July 20th, National Inclusion Project ran a hashtag initiative. They asked people to use the hashtag “#friendshipis” to promote inclusion. 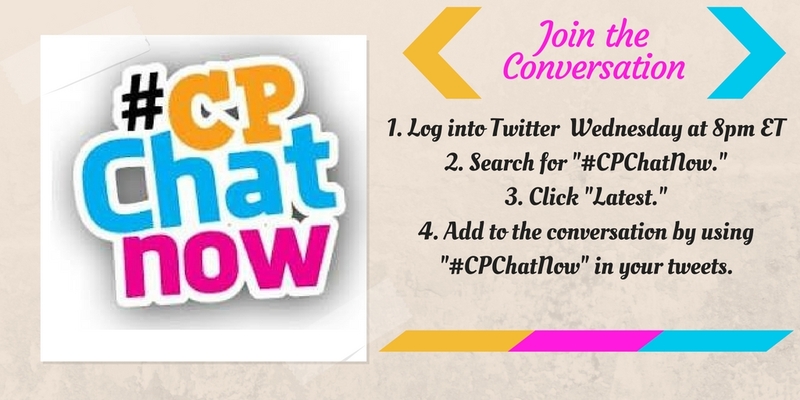 Liking the concept, I suggested we at #CPChatNow participate. 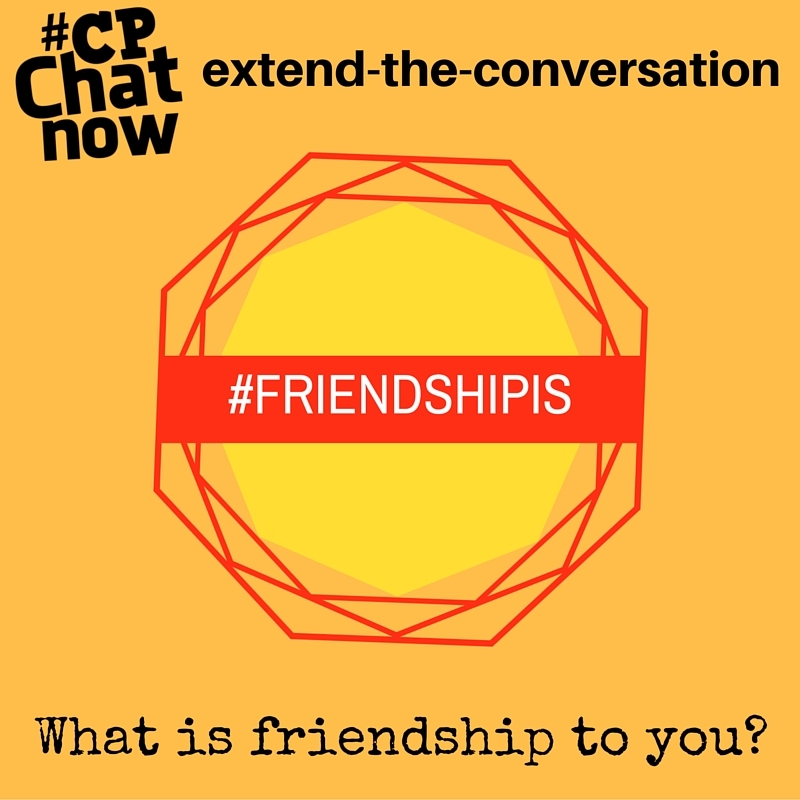 Actually I loved the #friendshipis campaign so much I wrote a detailed blog post on the matter over at my blog. To self-promote a bit, checkout out the post. Additionally, give your opinion too! The week’s extend-the-conversation question keeps the July 20th conversation rolling. “What is friendship to you?” Leave your answer in the “Comments” section. 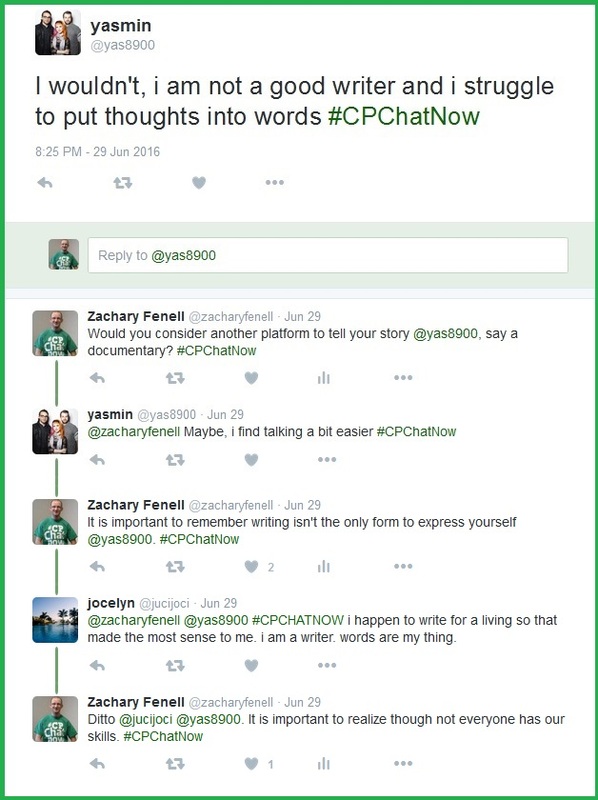 Speaking about comments, a post from the #CPChatNow Facebook fan page stirred some chatter. 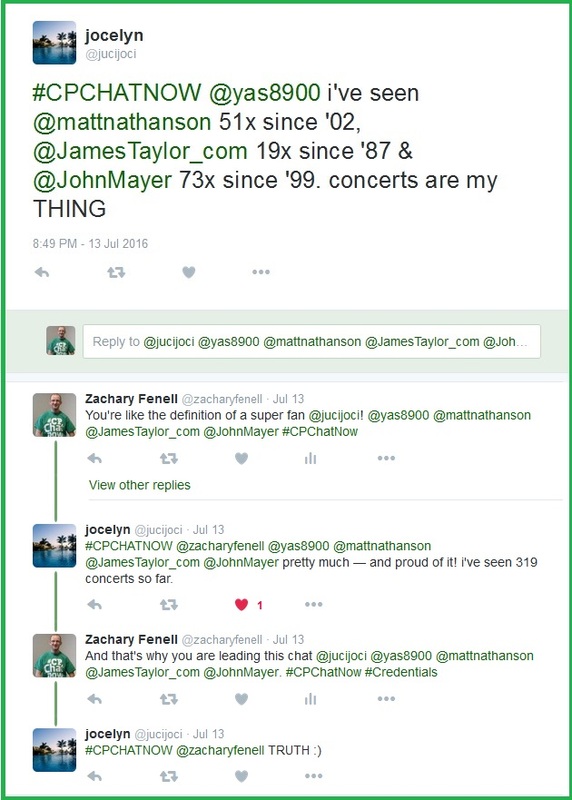 Talk which crossed over into the July 20th Twitter chat. Read the specific post for more context. Make sure you like the Facebook page too! Blake and I work diligently to share cerebral palsy related stories through the page. Similar to the extend-the-conversation question, the Facebook page keeps the community fun pumping all week long. Since I mentioned the extend-the-conversation question, let me remind you to answer this week’s question. 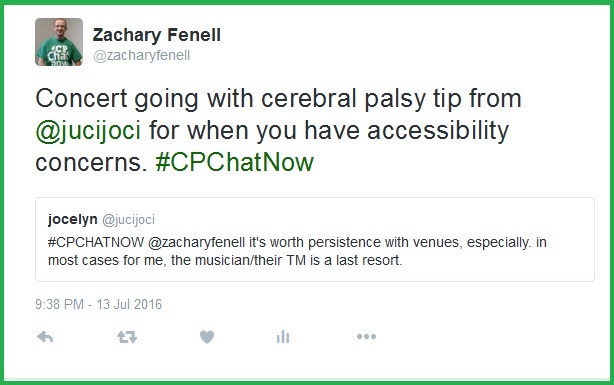 Wednesday, July 13th, 2016 #CPChatNow’s own Jocelyn led July’s focus chat on concert going with cerebral palsy. I am co-host Zachary Fenell ready to rock the recap. No cover charge needed! Just sit back and enjoy. 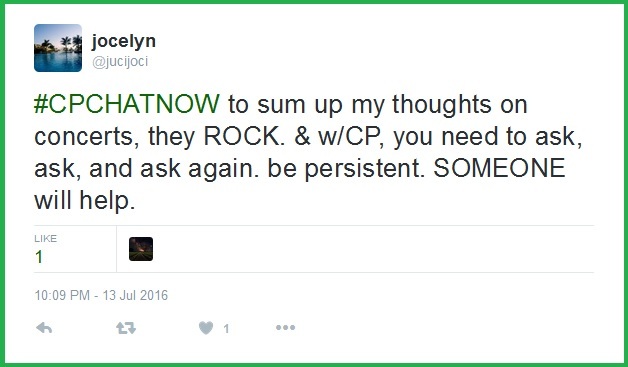 As the discussion started flowing, Jocelyn’s credentials became quite evident. 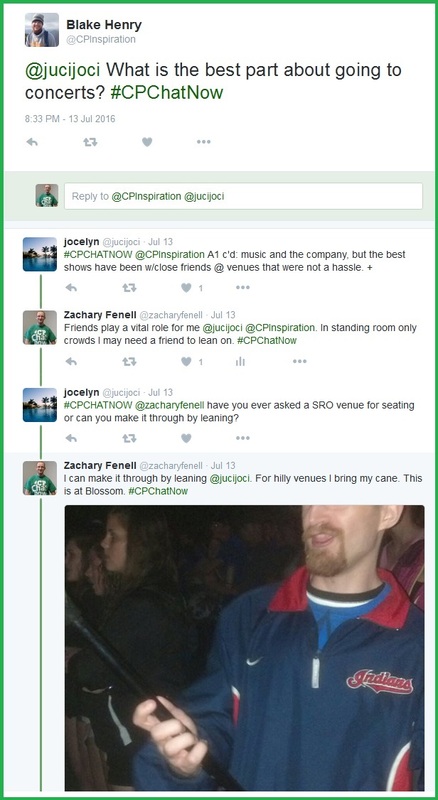 While fun, concert going with cerebral palsy can prove physically challenging. Such challenges multiple people addressed. 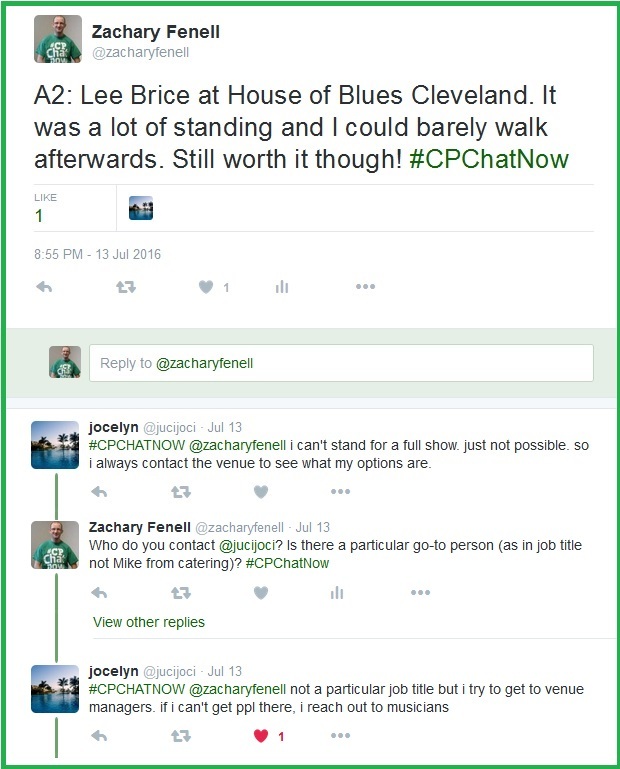 If you do not hear back from the venue or musician, Jocelyn named a last resort option. Before proceeding with the recap, how about you chime in? Answer the following for the week’s extend-the-conversation question. 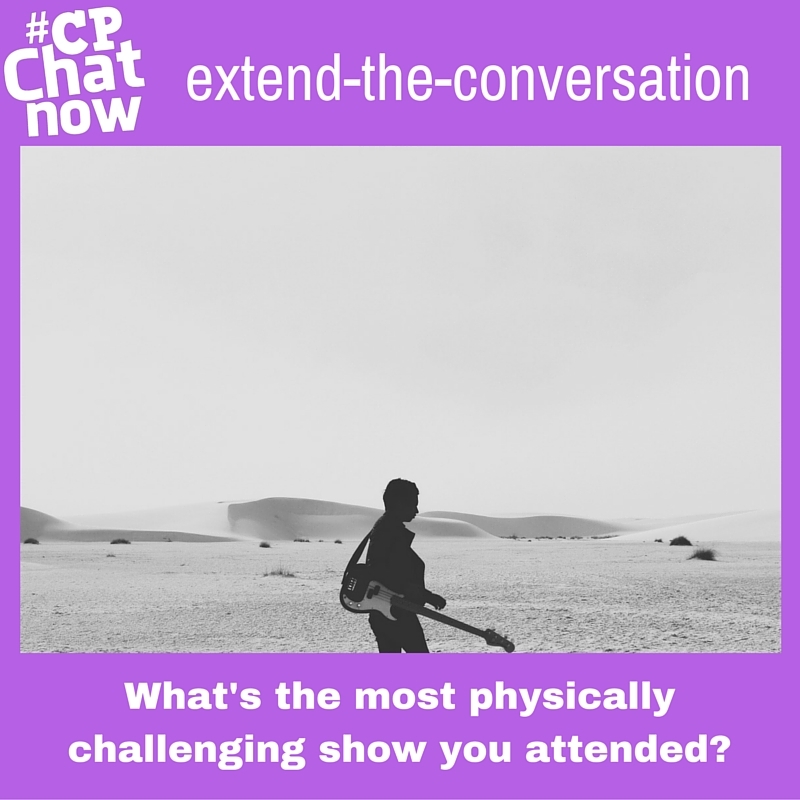 “What’s the most physically challenging show you attended?” Reply in the “Comments” section. Moving on, my co-host Blake Henry sparked dialogue by asking Jocelyn a question. Throughout the night Jocelyn emphasized reaching out to inquire about accessibility options. A point she echoed again in her final comments. Hopefully you found the insights recapped here helpful. Remember you can still add to the discussion. Take a moment to answer the extend-the-conversation question. Like always, leave your response in the “Comments” section below! 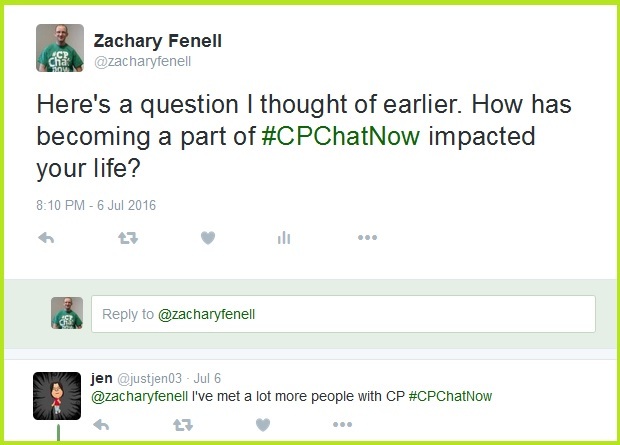 To kick off July the #CPChatNow community reflected. Co-host Zachary Fenell here, guilty causing said reflections. Everything started with one question. Besides building community to reduce isolation, another common theme emerged from the answers. Current events actually wound up finding a way into the night’s dialogue as well. Speechless revolves around JJ, a nonverbal young man with cerebral palsy, and his family. This three-minute trailer gives a good idea what issues you can expect Speechless to tackle. While my response to live tweeting Speechless remained partly humorous, doing so could lead to amazing dialogue. Obviously people will need to watch to make live tweeting work. 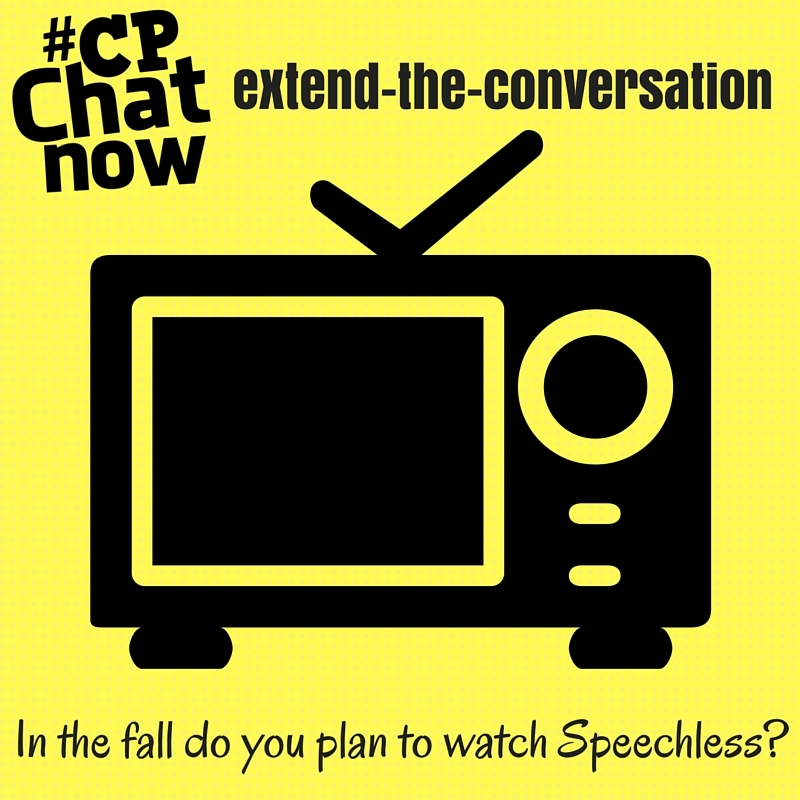 Therefore let me ask as the week’s extend-the-conversation question, “In the fall do you plan to watch Speechless?” As always respond in the “Comments” section. Though an exciting buzz surrounds Speechless, let us not overlook the summer. Much summer fun still awaits ahead. Maybe you plan on seeing a couple concerts. 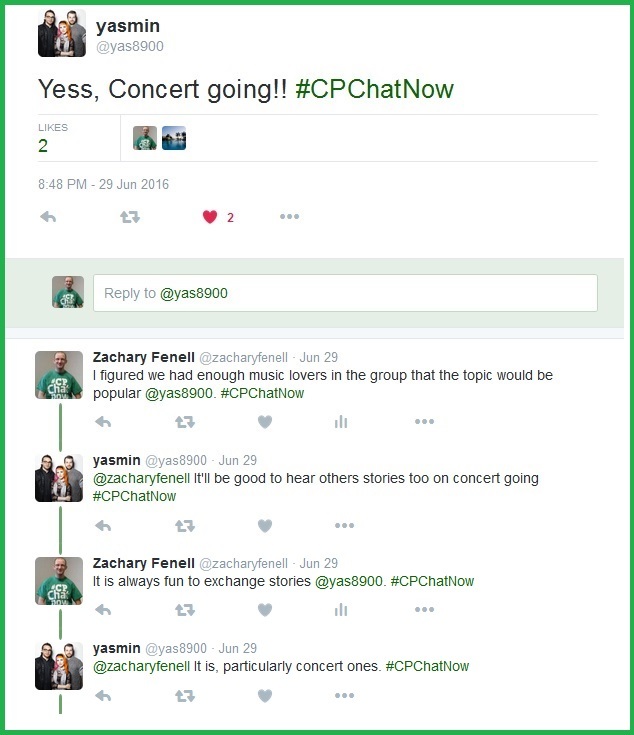 If so, you will want to stop by tonight on Twitter for our “Concert Going with Cerebral Palsy” focus chat. Tonight’s focus chat leader Jocelyn dropped in last week to share her excitement for tonight. 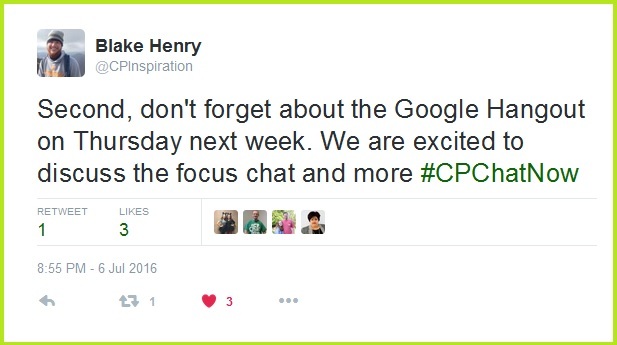 My co-host Blake Henry reminded us a second reason to feel excited about the week. Once a month we use Google Hangouts to enjoy a video chat. The invitation goes out around 8pm ET. Do you want to join the Hangouts fun? Please direct message Blake or myself to request an invitation. To maintain a private setting we do not post the link publicly. Meanwhile as you stir in excitement for tomorrow’s Google Hangout and tonight’s focus chat, remember to answer the week’s extend-the-conversation question. 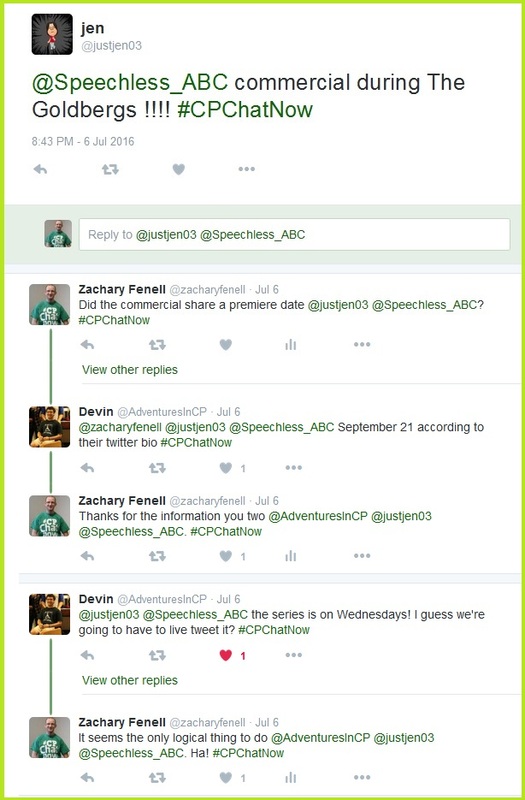 Your answer will help determine if we should live tweet the show come September. Answer below by commenting. 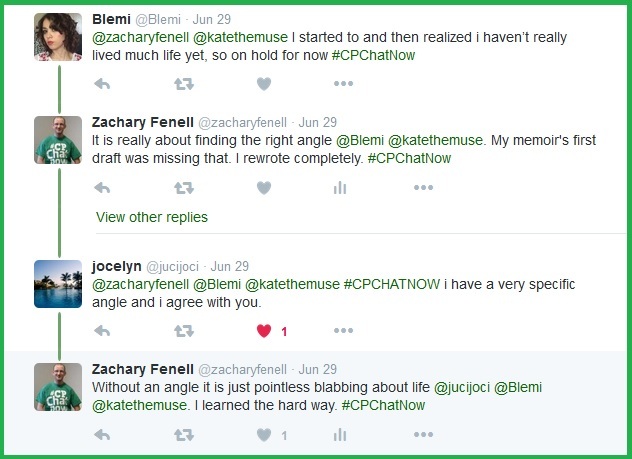 Writing a cerebral palsy memoir remained among the popular topics discussed during #CPChatNow Wednesday, June 29th. Hello again! Co-host Zachary Fenell finally here to recap our most recent chat. Before talking about writing memoirs though, regular Devin showed off his brand new shirt. 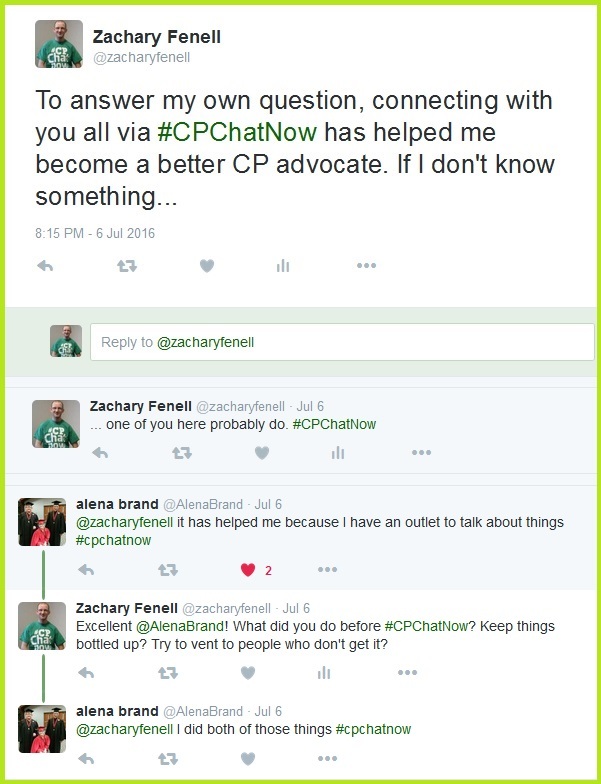 If you want to wear your #CPChatNow pride too, your opportunity closes fast. 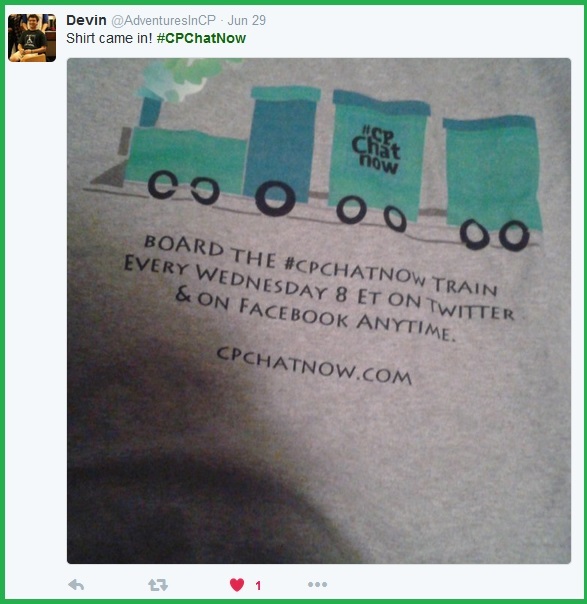 The #CPChatNow T-Shirt and Tank Tops Fundraiser ENDS THIS MONDAY (JULY 11TH). Profits go to the nonprofit Keep On Keeping On Foundation. Make sure you order ASAP! With that reminder finished, time to re-focus on recapping. Early on my co-host Blake Henry and I teased announcing our July events. Before those however, the dialogue picked up with a question asked the previous week. Other aspiring authors emerged from our community as well. Their ambitions helped reveal the challenges involved in writing a cerebral palsy memoir. 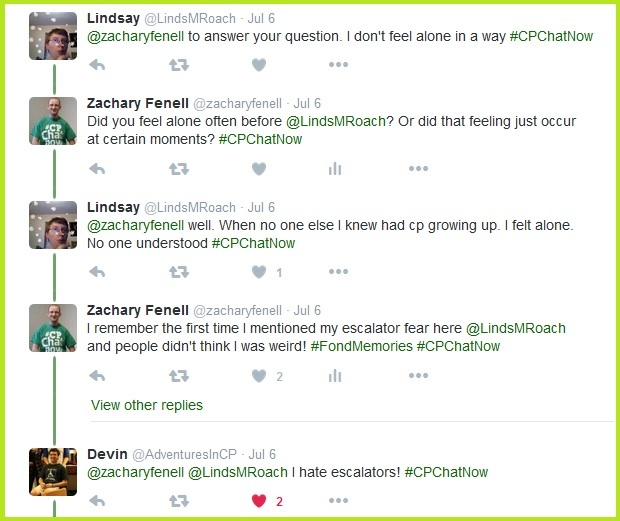 As someone with a published cerebral palsy memoir, I added an experienced voice to the dialogue. To share a shameless plug my memoir Off Balanced remains available on the Kindle and Nook. 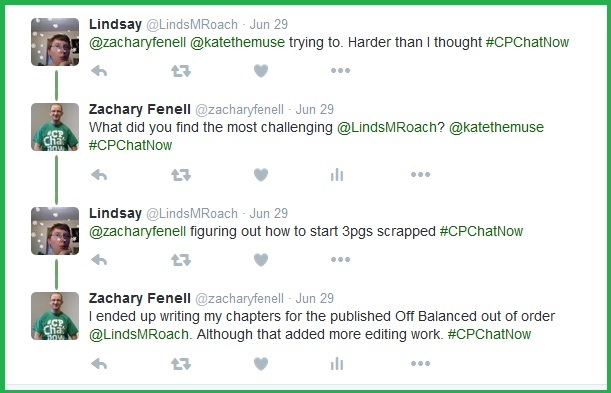 Off Balanced focuses on my adolescent years, particularly how my CP impacted me socially. 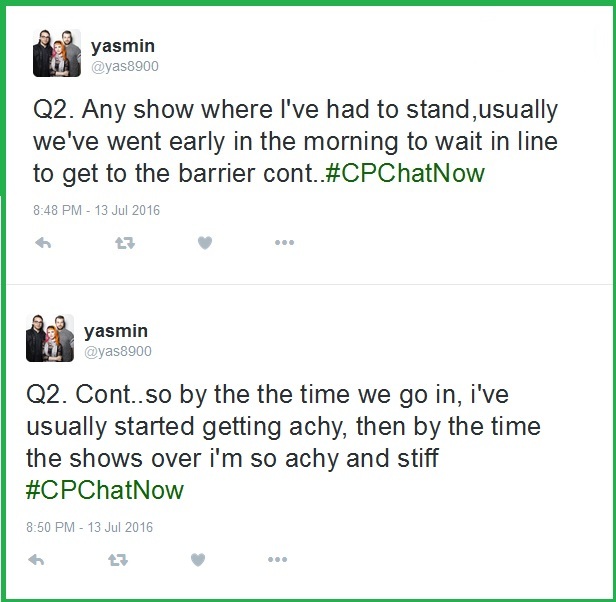 Basically my journey from embarrassment to embrace over CP. Yet, not everyone possesses the writing skills to write a book. Said fact raised a valuable point. Let us use this week’s extend-the-conversation question to highlight the various platforms you can use to express yourself. 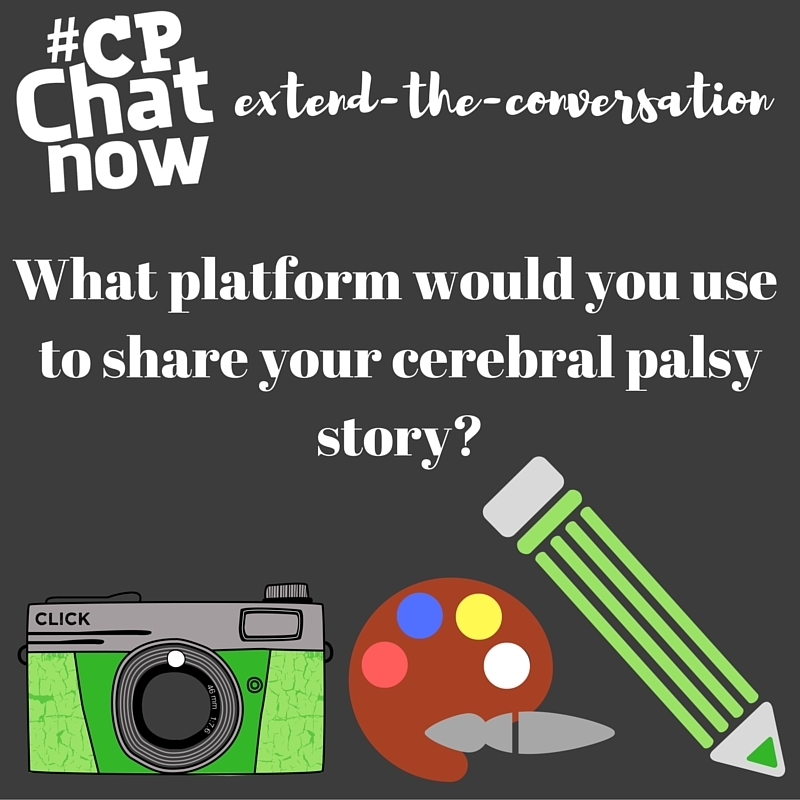 Answer “What platform would you use to share your cerebral palsy story?” Leave your response in the “Comments” section. 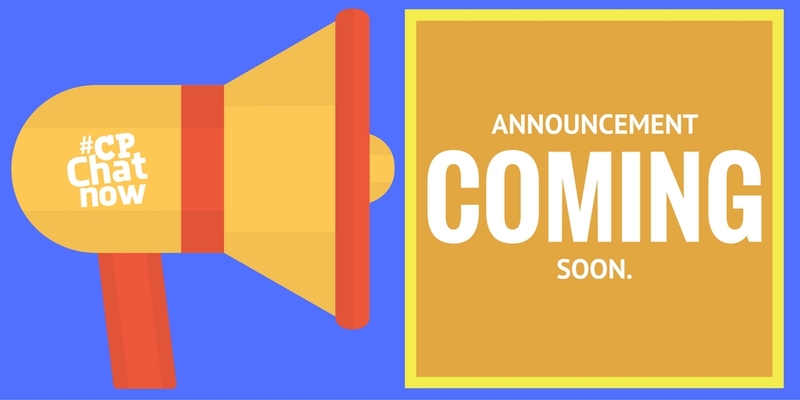 Continuing on, like promised, Blake and I announced our July events. First I broke news about our July focus chat. 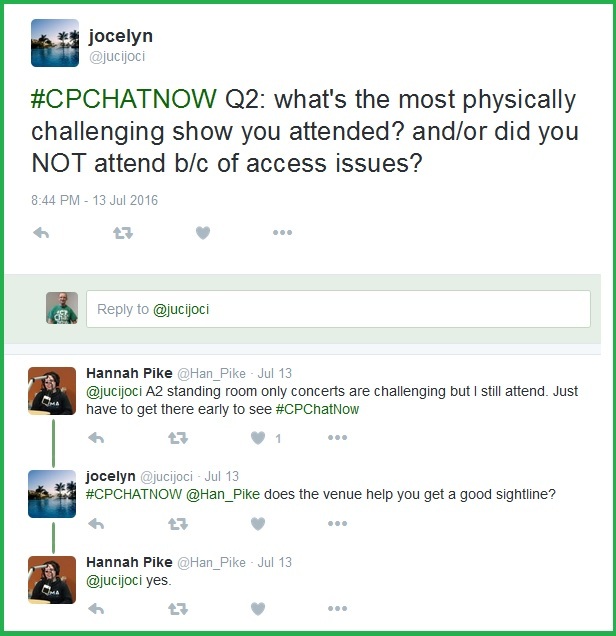 The “Concert Going with Cerebral Palsy” focus chat marks our latest internal focus chat. Internal focus chats give our community members the spotlight to share their expertise and passions. 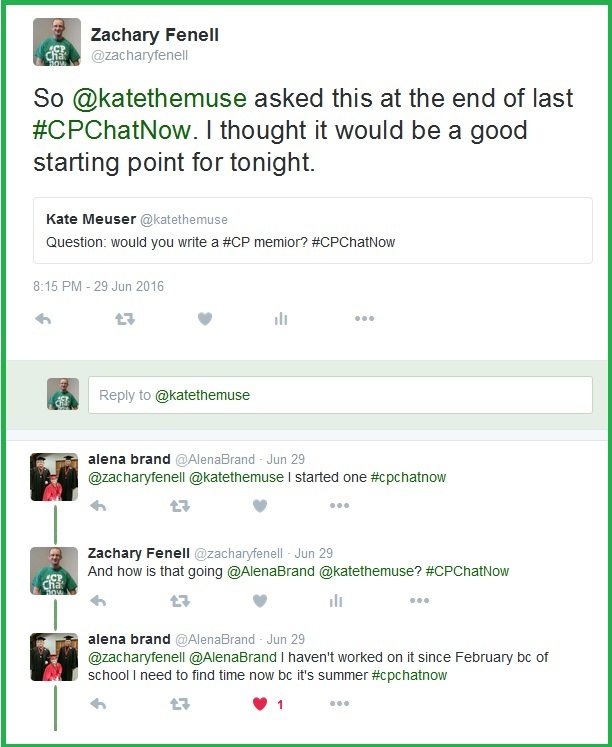 After making our July 2016 focus chat announcement I put a feeler out seeking future internal focus chat leaders. Contact Blake and/or I via a Twitter direct message if interested in this pro bono opportunity. 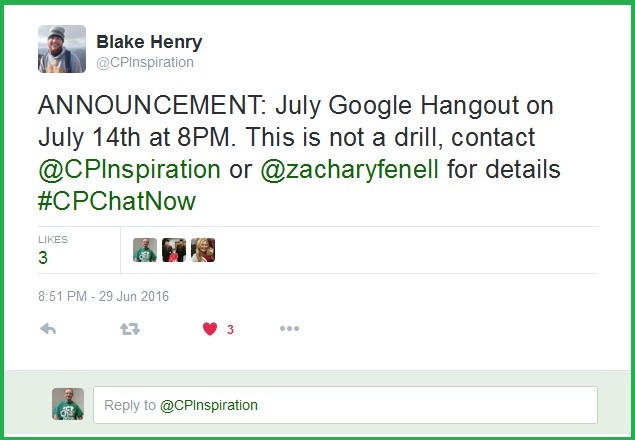 Speaking of Blake, he announced the date for our July Google Hangout. 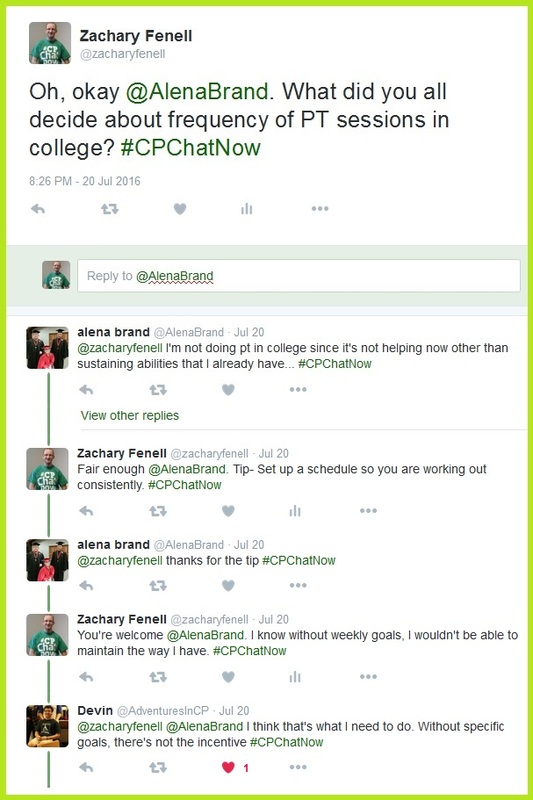 Do not miss any July #CPChatNow fun! 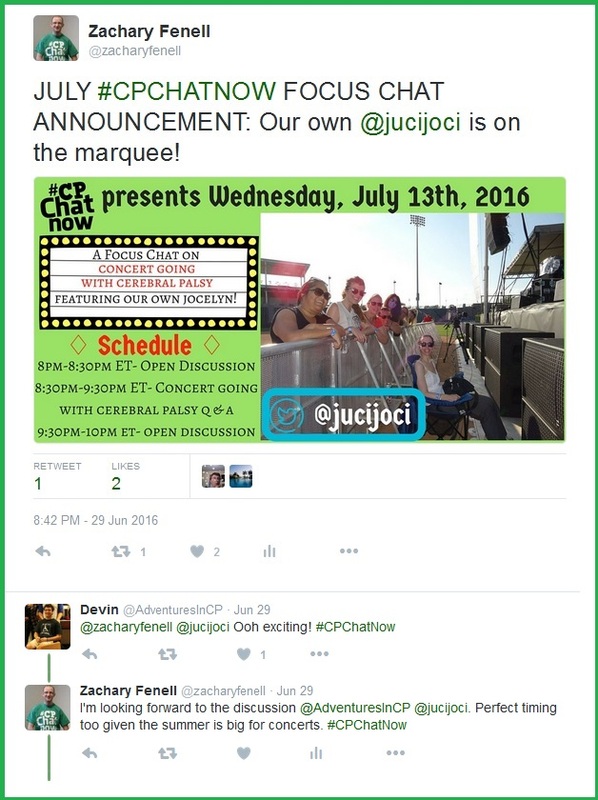 Mark your calendars for Wednesday, July 13th (“Concert Going with Cerebral Palsy” focus chat) and Thursday, July 14th (monthly Google Hangout). Then come back to your device to answer the week’s extend-the-conversation question. Again, answer by commenting below. 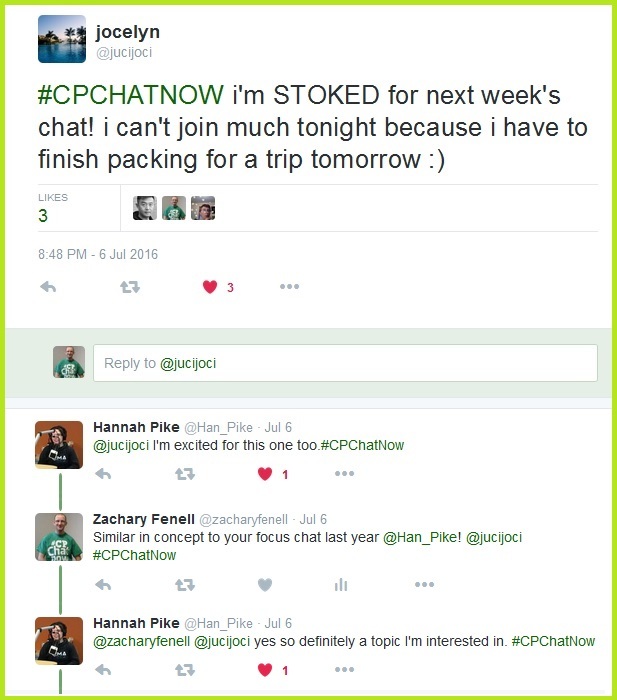 Finally, remember you MUST purchase your #CPChatNow shirts by Monday, July 11th. Order ASAP!